Grace was beautiful and intelligent little girl who is forever 4 1/4 years old. Grace went to school for the first time in September 2014. She loved school and always came home each afternoon happy and chattering about her friends and what she had been doing in school. Grace was a bright and caring child and even at the age of four, put others first and in particular her loving mother. She had many friends and was often mentioned by other parents as a lovely child that everyone wanted to know. Until September 2014 Grace was a completely healthy little girl. Petite, but perfect. 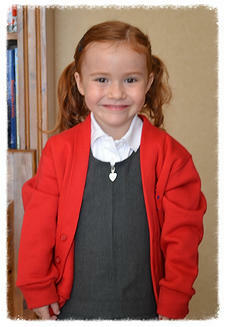 She started school in September 2014 aged four; We were all so proud! Grace had a few viral infections and high temperatures, much the same as other children in her class at school, although perhaps they hit her harder than the others. She was more tired than usual, but then she was a worrier and also new to school. On 18th October 2014 Grace went to school as usual; we happened to staying for a few days and we saw her skip off up the road chattering away to her friends. After school Grace saw us walking up the road to meet her and she ran full pelt towards us throwing her arms wide in a joyful and happy embrace. Shortly after arriving home together, friends we had not seen for 30 years arrived at the door. Grace was quick to greet them and to introduce us. We then had to leave and to return to Yorkshire, a long drive away. The following morning we received a call to tell us that Grace had been taken ill and rushed into hospital in terrible pain with suspected appendicitis. After a week of indecision Grace had clearly deteriorated and then a CT scan confirmed that she had a renal tumour, initially thought to be a Wilms tumour. Grace was transferred to the Birmingham Children’s Hospital and specialist consultants were quick to commence a better programme of pain management and later to perform a biopsy of the tumour. Sadly Grace continued to deteriorate very quickly after the biopsy and was in a great deal of pain. On November 7th, the histology came back as a very rare and malignant rhabdoid tumour. As she had metastases, she was deemed palliative. Grace passed away in her mother’s arms on the evening of 8th November 2014 with her father holding her little hand and surrounded by her loving grandparents; Grace was only 4 1/4 years when she passed away in Birmingham Children’s hospital. Grace had received her terminal diagnosis only the day before she died; less than 3 weeks after becoming visibly unwell. We were allowed to take Grace away from the hospital later in the evening to the Acorns Children’s Hospice, in Worcester. A very special room had been prepared for her and she able to stay there until we could prepare for her burial. The support staff in the Hospice were amazing and continue to give support to the family. Grace left behind grieving parents and grandparents as well as Jessica, her little sister, who was only 10 months old when she died. Clearly Grace’s parents, both of whom are doctors and the rest of the family will never get over this terrible loss, but together they are committed to doing something in Grace’s memory to help stop this happening to other children.